The VIA QSM-8Q90 system on module is based on the new QSeven embedded form factor and offers full 64-bit computing and high performance multimedia features suited for a variety of next-generation handheld applications. Available with a 1.0GHz VIA Nano E-Series processor, the VIA QSM-8Q90 module also integrates the unified VIA VX900 media system processor, featuring the VIA ChromotionHD 2.0 video engine which boasts hardware acceleration of the most demanding video formats for incredibly smooth playback. With advantages of its compact size, integrated thermal solution and low cost connectors, VIA QSeven is the ideal building block for various low power and handheld applications. It supports up to 12W of maximum delivered power and provides legacy free interfaces for embedded applications along with display interface support with one single channel 18/24-bit LVDS connector. Targeted at industrial PC and large OEM customers focused on dynamic handheld application segments, including medical, advanced gaming, military and test & measurement equipment, customers can take advantage of a proprietary start-up kit including a multi-I/O baseboard reference and 7" LVDS display, or can utilize VIA's extensive technical support in developing a custom baseboard. 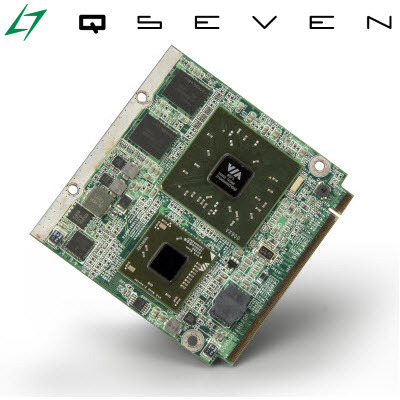 Measuring 70mm x 70mm, QSeven is a new embedded form factor developed to provide a cost effective solution for power sensitive applications. The QSeven specification integrates core CPU, chipset and memory on the module, providing support for extensive connectivity options, including USB, audio, video, and Ethernet, through a connector to an I/O baseboard.